News that Jah-Nhai Perinchief broke Nicky Saunders’ long standing Bermuda Junior National Record high jump, Bermuda was cited by Condé Nast Traveler‎ as one of the “15 Best Islands for Foodies,” the international cast of ‘Up With People’ was welcomed to Bermuda, and Temptations has re-opened in St. George’s following renovations were all some of the positive news stories from the past week. In other good news, 13 of Bermuda’s talented young athletes were presented with Junior Athlete Sponsorship Awards, Trey Simons was named the Men’s Track MVP for the the 2016 Southern Intercollegiate Athletic Conference Track & Field Championship, and the Dog Training Club of Bermuda donated $6,500 to local causes following agility competitions held at the Ag Show. 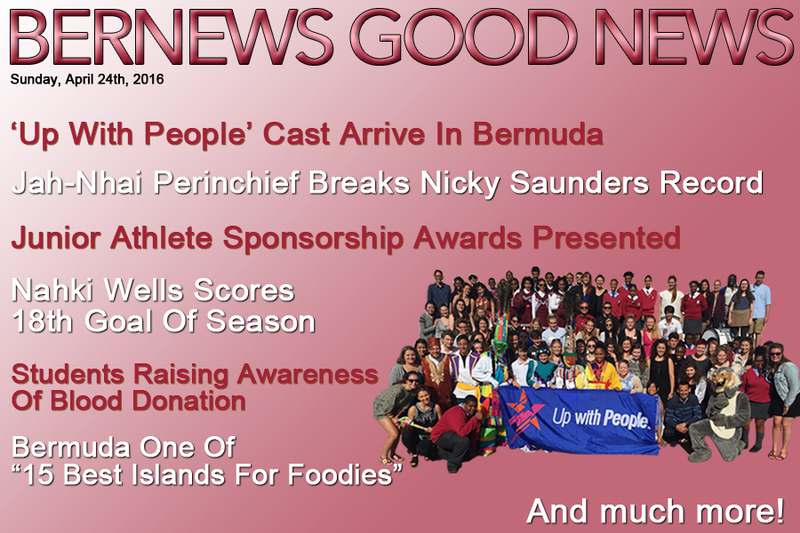 Additional good news stories included Nahki Wells scoring his 18th goal of the season, Bermudian Jenaya Wade-Fray scoring 30 points for her Brixton Topcats team to claim the final spot in the playoffs in the Women’s British Basketball League Championship, a group of Somersfield Academy students raising awareness of the need for blood donation, and Royal Caribbean announcing its Bermuda cruises for the 2017/18 season. We also posted various community photo galleries, including coverage of the reopening of Temptations following its renovations, cricket, football, Up With People’s visit to Cabinet, the BIU block party, the CedarBridge career fair and more.